Since he won the USSU Young Alumni Excellence Award two years ago, Stavros Stavrou’s (BSc’10, MSc’12, MEduc’15) contributions to his field, the University of Saskatchewan and the community have multiplied exponentially. "When I received the award, I was working on my master's degree in the College of Education, which I completed last fall," said Stavrou. 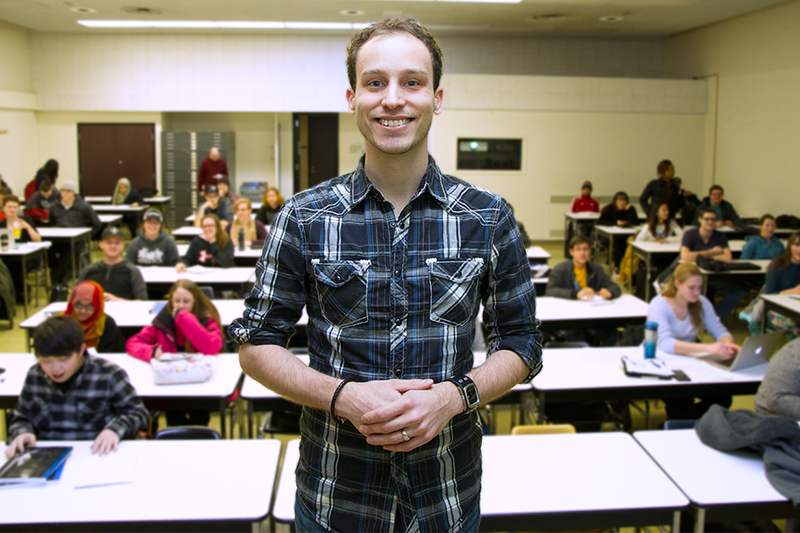 "My goal is to earn a faculty position at the U of S, and I started teaching in the math department last summer. I'm now looking into starting my PhD." Stavrou was nominated for the award by his friend Paulo Arago (BA'14) for his scholarly achievements as well as his passion for teaching math in a way that makes it accessible for First Nations, Métis and Inuit students. As the math outreach co-or­dinator at the U of S, Stavrou develops hands-on math activ­ities that incorporate Aborig­inal culture and anti-racist teaching practices for students and teachers in the K-12 system in Saskatoon and local reserve schools. He collaborates with teachers, elders and researchers to develop innovative ways to teach mathe­matics. One of Stavrou's classroom activi­ties teaches students geometry by using a treaty map of Canada to plot points and measure distances. In another lesson, he uses collabora­tive learning where students teach him to count in Cree. Another class uses things found in nature—like the branches of a tree or a lightning bolt—to explain fractal patterns. "I teach this way because a lot of students don't connect with the Western style of teaching where a teacher pulls out a textbook and asks the class to follow along. These ideas enter their brain and are inert—they don't react with their daily lives," he explained. Helping learners of all ages succeed at learning math is one of Stavrou's hallmarks—even students at the university level rave about his practical and easy-to-understand approach to math. "When I won the award, my picture was hanging up in lower Place Riel for a year," said Stavrou. "I've been a teaching assistant and tutor for the past five or six years, so I regularly received text messages from people I taught saying that they saw my picture and congratulating me." A recent highlight for Stavrou was presenting at TEDxSaskatoon in November 2015 about his work as a cultural mathematician. "What I do in the community, I connect with the U of S," he said. "I'm proud to represent the university."